You are here: Home / Featured / Congratulations, Class of 2018! At lunchtime on Saturday, the crowd outside Norwich University’s Kreitzberg Arena resembled a scene you might see at an airport gate. Families were embracing, kissing, and offering words of support. There was a bit of nervous energy, a bit of eagerness. Most of all, there was pride: they’d come to cheer on their loved ones, who waved goodbye and headed inside to don caps and gowns. Farr and more than 500 fellow students earned associate degrees this year. The class represents every Vermont county as well as 11 other states and 15 other countries. 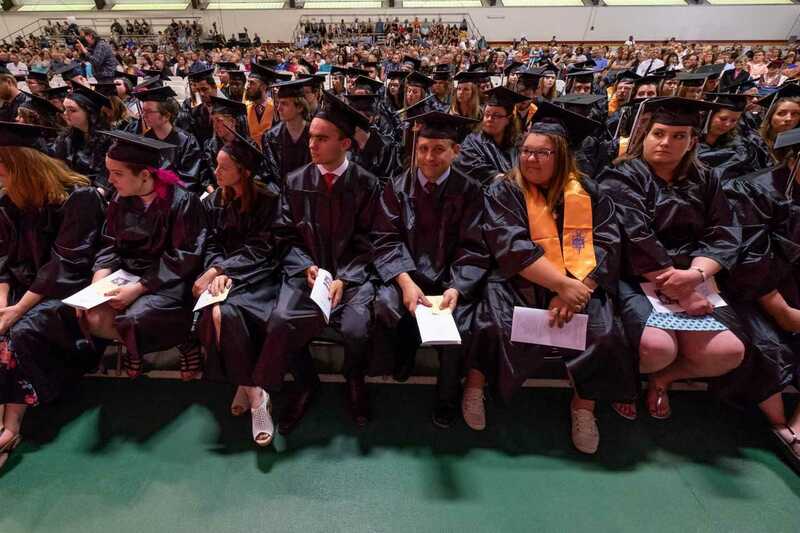 The youngest graduate, Adrian Berry of CCV-Montpelier, is 17, and the oldest, Theodore Nykiel, also of the Montpelier center, is 73. The class also includes more than 60 veteran and military-connected graduates, and more than 60% are the first in their family to earn a college degree.